Dr. Ashish Nema has an overall 12 years of experience in Cardiology. 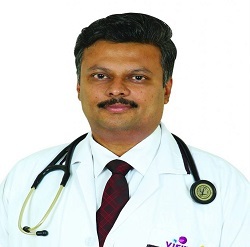 He started his professional career with Indraprastha Apollo Hospital, New Delhi in 2002 as Senior resident in department of Gastroenterology and Cardiology. He worked as an Assistant Professor in Dept. Of Medicine at NSCB Medical College Jabalpur for 4 years. He completed his Fellowship in Cardiology (D.N.B.) from Care Hospitals, and continued working there as Junior Consultant in Cardiology for an year. He also got his fellowship of American College of Cardiology in 2017. Dr. Ashish completed his M.D. (Medicine) in 2002 from Berhampur, Orissa and D.N.B. (Cardiology) in 2010 from N.B.E., New Delhi. He has attended many national conferences and workshops on Cardiology. Interventional, Non-interventional, clinical cardiology and research activity in department of cardiology is of special interest to him. 2002 – 2007 Assistant Professor at Netaji Subash Chandra Bose Medical College.